Kowalski was the son of Polish immigrants, born Edward Walter Spulnik on October 13, 1926 in Windsor, Ontario. He majored in electrical engineering at Assumption College (now part of the University of Windsor) while working part-time in Detroit at the Ford Motor Company. Kowalski began his wrestling career in 1948, after being spotted working out in the Windsor YMCA. 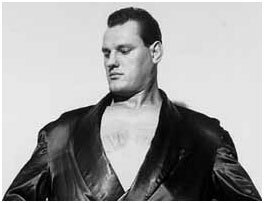 He gained the moniker “Killer Kowalski” after a match with Eric Young in 1952, during which a knee drop from Kowalski severed a piece of his opponent’s ear. He went on to have a 26 year career, holding multiple championships with the World Wide Wrestling Federation (now World Wrestling Entertainment/WWE). Kowalski participated in the first wrestling match televised in Canada on January 14, 1953. In the 1960’s Kowalski became a vegetarian and would be an outspoken advocate for vegetarianism the rest of his life. Kowalski retired from wrestling in 1977. After retiring he became a teacher of his own wrestling school, the Killer Kowalski Institute for Professional Wrestling in Malden, Massachusetts. Kowalski married his long-time girlfriend Thersea Ferrioli on June 19, 2006, at the age of 79. A series of escalating health-issues affected Kowalski in his later life, culminating with a massive heart attack on August 8, 2008. He passed away on August 30, 2008 due to complications from the heart attack. He was 81 years old. Goldstein, Richard. “Killer Kowalski, wrestler, dies at 81.” New York Times. Aug. 31, 2008. Web. Accessed Feb. 13, 2018. “Killer Kowalski.” Online World of Wrestling. Web. Accessed Feb. 13, 2018. “Killer Kowalski.” Slam Sports. Web. Accessed Feb. 13, 2018. “Killer Kowalski.” WWE.com. Web. Accessed Feb. 13, 2018. “Killer Kowalski passes away.” WWE.com. Web. Accessed Feb. 13, 2018. Oliver, Greg. “Killer Kowalski dies.” Slam Sports. Web. Accessed Feb. 13, 2018.